The International Public Policy Association awards the Global South Award biennially to an academic employed on a full-time basis in a university located in a country identified as a developing economy, and whose publications( book or articles) are directly related to public policy and/or public administration issues in one or more of the identified countries. The list of developing economy countries is available on the IPPA website here. 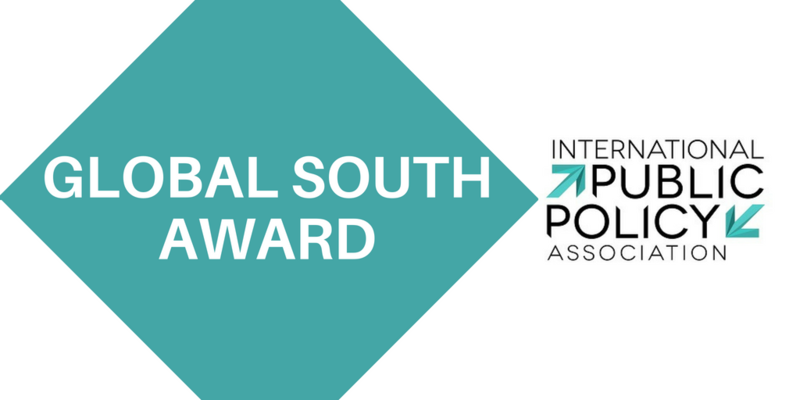 The 2019 Global South Award will be announced in January 2019 to the winner and will be officially presented at ICPP4-Montreal 2019,(June 26-28, 2019) where the award winner will give a lecture on his/her scholarship. A Jury established by IPPA comprised of M. Ramesh (chair), M. Jae Moon, Jose-Luis Mendez and Natália Massaco Koga will determine the winner of the Global South Award. It will make its decision on the basis of nominations submitted by IPPA members.